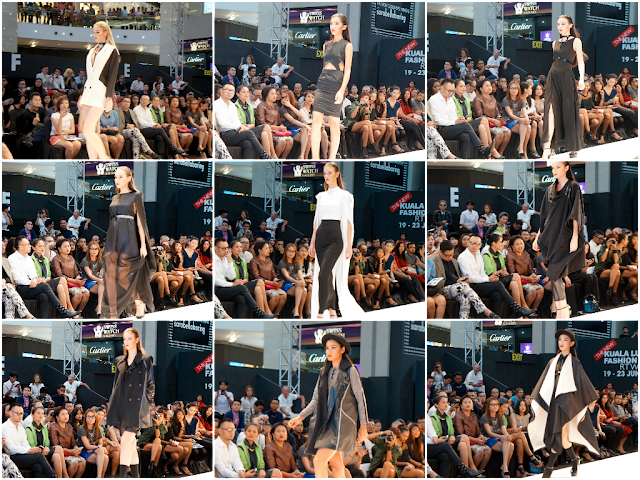 Kuala Lumpur Fashion Week (KLFW) 2013 - Day 1! The Kuala Lumpur Fashion Week RTW 2013 is one of my most anticipated event. Thanks to the twins I got to watch the emerging and established local fashion designers showcasing their lastet Ready-To-Wear collection. We went on the first day of KLFW @ Pavilion, supporting our favourite designer Pearly Wong. Here are part of Pearly Wong's collection. Her design highlights minimalistic using 3 major colours of black, white and grey. Click here for more picture. Other designers that represented the young ones include Allien Gan, Ezzati Amira and TSyahmi. But i only got pictures of TSyahmi's collection. Also loving those heels that match perfectly with his clean and bold design pieces. Attending such fashion event, I always love to wear a modern minimalist style. Abandoning all the access, I chose to wear an one piece dress that presents a clean, fresh and bold look. It very much reflects the theme of the designers' collections. The unequal cut out ruffles at both sides of the dress shows great curvilinearity and modernity. Along with the rule of simplicity, I finished the look with a pair of classic white pointy heels.